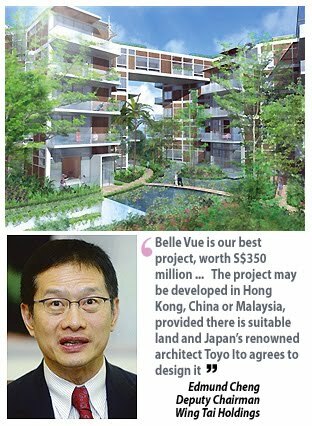 WING Tai Holdings Ltd, a property developer, will launch several new projects in Malaysia as it is bullish on the market, its deputy chairman Edmund Cheng said. Wing Tai will continue to develop high-end properties in the Klang Valley. It currently has 80ha of land in Kuala Lumpur and Penang. "We are looking to increase our landbank in the Klang Valley, and work with suitable partners," he said. Wing Tai, through its Malaysian-listed unit DNP Holdings Bhd, will launch Kondominium Nobleton Crest at Jalan U-Thant in Kuala Lumpur in 2011, pending market conditions. The project comprises three blocks of low-rise residences. It will also launch a prime development in Jalan Ampang, Kuala Lumpur, comprising two blocks of 49-storey and 43-storey serviced residences. The project, on a freehold site spanning 0.6ha, is under construction. "Work is progressing well. The launch will depend on market conditions. The market can expect several other exciting projects," Cheng said in a recent interview with Business Times in Singapore. Wing Tai, through DNP, is currently developing Verticas Residensi, 423 units of freehold condominium in the Bukit Ceylon enclave. Cheng said the project has received good response from the preview of its Tower A in July 2009. Tower B was officially launched in January 2010 and the units have been quite well received, he said. Verticas is under construction and it is expected to be completed in 2012. Its other ongoing developments are in Penang. They are Sentral Greens in Relau, Phase 2 of BM Utama in Butterworth, and Phases 4 and 5 of Taman Seri Impian, comprising terraced and semi-detached houses. Wing Tai started in Hong Kong as a garment manufacturer in the 1950s. It expanded its business in Malaysia in the 1960s and has developed over 70 projects to date. Real estate investment trust Amanah Harta Tanah PNB could add over RM500 million worth of assets in its portfolio within the next four years. AHP now has a total of RM142.3 million worth of assets, including Plaza VADS and Bangunan AHP in Taman Tun Dr Ismail in Kuala Lumpur. More assets are coming to AHP because PNB Commercial Sdn Bhd, the asset management subsidiary of Permodalan Nasional Bhd, has set its objective of turning around the commercial properties within PNB Commercial's stable, which will later be offered for injection into the REIT. PNB Commercial owns and manages 11 properties as well as manages nine other assets for PNB. The total value of the assets is RM1 billion. The 11 properties that PNB Commercial owns and manages are valued at around RM460 million and are scheduled to undergo a RM70 million makeover in 2010 and 2011. PNB Commercial chief executive officer Datuk Mohamed Marzuk Basir said PNB Commercial has given itself five years to flip the properties so that they gives better yields. "We have three-and-a-half years remaining to work on our assets, efficiently manage and refurbish them, and bring them to a healthy level," Mohamed Marzuk told Business Times in an interview. Office buildings owned by the company include PNB Commercial House in Penang, as well as Wisma Nusantara and Menara Aik Hua in Kuala Lumpur. Its retail assets are Pudu Plaza in Kuala Lumpur, a retail complex in Kajang, Selangor, and Perling Mall in Johor Baru. Hospitality assets include three-star Hotel Sri Petaling in Bukit Jalil, Kuala Lumpur, and Lanjut Golf and Beach Resort in Kuala Rompin, Pahang. Currently, the yield derived by these assets ranges between 2 per cent and 7.8 per cent and occupancy levels at its office buildings range from 50 per cent and 90 per cent. Mohamed Marzuk expects that once occupancy level hits 80 per cent, PNB Commercial should be able to have a decent yield of 7.5 per cent to 9 per cent. Similarly, any new acquisition made will be upgraded and then potentially sold to AHP. The sale money will then be used as operating capital, for refurbishment and for acquisitions by PNB Commercial. It is understood that the retail complex in Kajang, leased to Tesco hypermarket with an estimated RM60 million value, may be the first property that will be turned around and ready to be sold to AHP. Mohamed Marzuk declined to comment on this but said PNB Commercial's task is to nurture the yields of all its properties and offer for injection into the REIT. A decision on whether AHP buys any properties would depend on approval from shareholders as well as a gearing level of not over 50 per cent. In the six months ended June 30 2010, AHP made RM7.53 million revenue and a net profit of RM4.04 million. In the financial year ended December 31 2009, it made a gross rental income of RM13.97 million and a net rental income of RM8.89 million.